Don’t let the name scare you – the only way this game can give you a stroke is through its sheer difficulty. 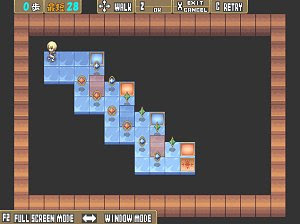 Stroke 1.4 is a freeware puzzle game of Japanese origins about a little boy who has to collect the gems in each level, but beware – there’s no turning back once you walk, since the tile you stepped on is gone forever. There are other special tiles that will teleport you, and the goal in each level is to collect the said gems and reach the exit. This is a game for the most patient fans of difficult puzzle challenges, so be certain that you will restart the same level over and over again. It’s worth it, though.